This is science fiction — specifically space opera. NOTE: These books are currently unavailable. I will keep people posted on when they’ll be available again. THANKS! Book 1, Far Seek Chronicles! 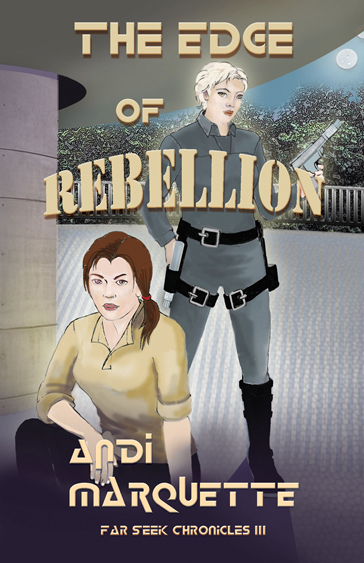 Outlaw Torri Rendego can’t shake her past, which involves her connection to her Academy bunkmate, Kai Tinsdale, now a commander in the hated Coalition. Torri thinks the Coalition is up to something on Kai’s family’s holdings. Problem is, she’s right, so she and the crew of the Far Seek devise an outrageous plan to gather information and get it to Kai somehow. But even the best-laid plans can go dangerously awry, especially where Kai’s concerned. Risking herself, her crew, and a tenuous tie to a shared history, Torri goes deep into Coalition territory to uncover a secret with far-reaching consequences for a distant and ancient culture. The stakes of this venture may prove way too high, even for a gambler like Torri. Cover art by Winona Nelson. Find her here, too. Where did the title for the chronicles come from? Awesome descriipptions of the series! How many books are planned for the series? Are you going to be offering a pdf box set of the completed series? Hi, there — I’m going to drop you a line via email, too. At any rate, I don’t have a set plan for how long the series is going to go. It’ll go until I don’t write it anymore, I guess. And no, I’m not going to offer a set of the completed series because like I said, I don’t have plans at this point to end it. It’ll go for at least a few more books, and I’m sure if I find a publisher to pick it up and continue it, they’ll probably be interested in making it available in bundles and in as many formats as possible. I’ll keep everybody posted, though! Thanks for stopping by. The third is available, like the first two, as a used paperback and you’ll probably be able to find it online that way. OR you can email me at my contact page. I can hook you up with a paperback of the third (The Edge of Rebellion). I might be able to hook you up with a PDF of the ebook, but I have to check my archives. I’m currently on the road and don’t have access to all my files. BOO! I’m also working on a fourth, and that will be all new. WOOOOOOOOOOO! Stay tooooooooned and thanks so much for your interest. Thanks for stopping by. I assume you’re referring to the reprints, yes? I just released the 2nd edition of “Friends in High Places” and am currently engaged in an overhaul of the second, “A Matter of Blood.” I changed and added a bunch of things in the Friends reboot, so I have to make sure everything matches up in the second and third and the fourth, which is in progress. Hopefully “A Matter of Blood” will be re-released next spring.